1 in. 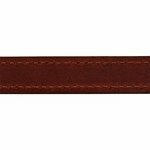 Mendota Hunt Dog Leather D-Ring Dog Collar . $23.95. "Came quickly and looks great." 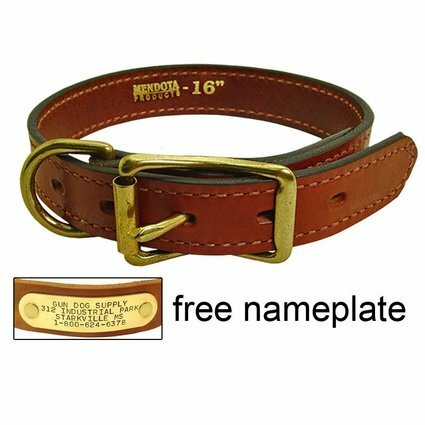 Ordered this with nameplate and matching lead for a friend's 8 mo old GSD. It is sharp looking, really well made and handsome. The friend loved it. When my puppy is closer to full grown, I'll order one for her, too. Came quickly and looks great. "BEAUTIFUL collar!! Excellent and fast service"
"Very quick service and excellent communication about order status." Very quick service and excellent communication about order status. Well constructed, handsome, great service and extremely well price. Could not be happier with my collars. This is a great product and made in America. Great collar. Can't beat it!!! Collar is very well made, looks fantastic, and the nameplate is professionally done. Would definitely recommend! Outstanding collar. Will hold up very well. Second one I've gotten! Bought this for a pet and like the D ring on the end and the fact that he has ID without any tags hanging from the collar. He wore out a nylon collar in about 2 years, and I foresee this one lasting the rest of his life. "Great prices and excellent quality." This is my second time ordering these collars - just love them! Great prices and excellent quality. I always get compliments and try to pass the word around. Wonderful value and will order again when needed! Great collar. This is my second one purchased, as I liked the first one so well. "Leather is tough and looks really good on my pup." Mendota is made in America and is a quality product. Leather is tough and looks really good on my pup. Very impressed. It was better than I expected. Black Lab,Boxer,Pit Bull. Family pet. Beautiful, lasting collar. Super fast shipping. "Very well made, good looking collar." Very well made, good looking collar. Only complaint is that I did not order 2, because I like it that much. Thanks for the good work. "Leather and stitching are very nice." Leather and stitching are very nice. The brass name tag stays positioned right on the back of his neck where you can read it. I don't use the collar with my leash. I use a slip lead, so the collar is just for looks and ID purposes. Great service, Great price, Great Quality! High quality, durable product. It looks wonderful as well. "Good quality and reasonably priced." Great product. Very reasonably priced. "They will last a lifetime!" The collars are made so well. They will last a lifetime! Wonderful quality, and the engraved ID tag is awesome. It is tightly secured to the collar keeping my dog safe. Very happy with this purchase. I like the material and the color. I love it. I just ordered my third Mendota collar. It is handsome, durable, and the nameplate is a nice touch. If you have a long hair breed like my Golden Retriever, I'd recommend the D-ring (just meaning the that ring for the leash is on the end of the collar). With the D-ring it's much easier to locate the ring in all that hair and snap the leash on. GREAT collar, looks good and fit is perfect. Thank you! Good quality and smart built collar. This is the second collar we have ordered from you guys. We just love them. We just got a black lab puppy, and this collar is great on her and will be great for hunting. She is also a spoiled house dog. The quality is outstanding and looks so nice. We custom ordered this collar late Wednesday night, and it was delivered by Saturday. We have recommended you guys to all our friends with dogs. Thank you for your great customer service and great product!! I absolutely love this quality collar!! I've had this collar for 7 years. High quality collar, delivered promptly! Great product and good quality. Shipped fast. Looks great and great price! I'd buy from you guys again. Thanks! As described. Looks good and is sturdy. Looks good. The leather appears to be a good quality and the collar is very sturdy. Important because this dog tends to break collars relatively easy. I don't for see it being an issue with this collar. Great collar, high quality all the way. Best service anywhere. Yellow Lab/English Bull Terrier. Family pet. Great collar...well made and looks great. Best collar out there - hands down. I've bought many of these over the years. Great collar! Love how it is sturdy, but still looks beautiful and simple. Also the nameplate turned out very nice. Would recommend this collar to anyone. It's a great collar, but the GDS customer service is excellent!! Very durable and great price. Handsome collar, very well made and heavy duty. Her old collar is 11 years old and manufactured just like this one. I just wanted her to have a new looking collar. Received very quickly. Very nice product. I will order additional products from them! Very nice collar. Excellent quality. Great product. I am concerned the vest might be too small. I ordered a 2xl because his neck measured 18 in. Love Reba's new collar from Gun Dog Supply. She outgrew her previous one, and I of course had to get another collar from Gun Dog Supply. They fit the dog great and last wonderfully in the salt water and all of the elements! Strongly recommend! Choc lab/ German shorthair. Family pet. Pointer Lab Mix. Family pet. Very sturdy collar. I like the riveted tag on it as well. "I am extremely pleased with this product and would definitely recommend it." I am extremely pleased with this product and would definitely recommend it. The leather is of high quality saddle leather type (but not too stiff). The hardware is extremely robust (but not overly bulky) and securely fastened. There is an extremely noticeable difference in quality favoring this product over what was available in all the local pet stores. You will have confidence in this collar and at the same time be pleased with the aesthetics. For my Brittany I was concerned about the stiffness and bulk of a collar that also works with much larger breeds purchasing "blind", but that has not been a factor. "I love the collar, and so does everyone who see's it. The quality is second to none." I love the collar, and so does everyone who see's it. The quality is second to none. I would recommend this product to everyone. Thank you Gun Dog Supply. You have a life long customer. "Looks professional and had the strength to match." The collar is on the thick side for Hunter, but it looks good, and I like the way it looks on him. I prefer this collar as the smaller sizes of the o-ring collar causes the excess length to cover the ID tag. This one is sized well and allows you to easily see the tag. Looks professional and had the strength to match. "Great product. Great service. Great company." Great product. Great service. Great company. 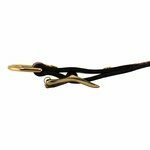 I've been buying collars from Gun Dog for years! They're the best! "Looks great and seems durable. Great customer service." Treeing Walker Coonhound. Hunts. Family pet. Looks great and seems durable. Great customer service. We love the collar. It is perfect for our dog Sadie. "From now on, ALL my dogs will wear your collars!!" Wish I would've found you sooner. From now on, ALL my dogs will wear your collars!! "Exceeded my expectations. Can't find anything to equal in the local stores in my area." Exceeded my expectations. Can't find anything to equal in the local stores in my area. Hope to do business with you in the future. Thanks for the excellent service. You are on my favorite list. "Attracts a lot of attention." Attracts a lot of attention. They all grab the name tag to read it. He looks good with it. "The best....Been buying them for years!" The best....Been buying them for years! "I've used your collars for years, and I've never seen better products." I've used your collars for years, and I've never seen better products. Plus you stand behind them 100%! "Have this for both my dogs now, and could not be happier with them!" Great collar. Have this for both my dogs now, and could not be happier with them! "All our dog friends at the park want one! Excellent value." All our dog friends at the park want one! Excellent value. "Good sturdy collar & a good value." Basenji & a cattle dog. Family pet. This collar is a good sturdy collar & a good value. Great Collar. In fact I need to get another and forgot where I purchased this collar until now. "Well made & handsome collar at a reasonable price"
I love it!! I have an inside beagle and can't stand the sound of dog tag clinging together. The brass plate eliminated the need for tags. The leather collar was sized very accurately (something I always worry about when ordering online). It was affordable, fits great, and was shipped in a very timely manner. I will be ordering another one for my Terrier from Gun Dog Supply. Great quality, and quick service. "Sizing instructions are great. This collar is substantial, well made, and fits perfectly." Sizing instructions are great. This collar is substantial, well made, and fits perfectly. True to photo. It's nice to have ID on the collar itself, instead of on a ring that gets tangled with dog hair. ID tag is easily shaped to conform with the curve of the neck. A winner. "This is a great durable collar that lasts." 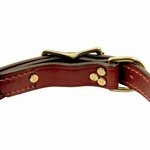 This is a great durable collar that lasts even on the neck of a German Shorthaired Pointer. High quality, beautiful collar. This dog has exploded cheaper collars (and a lead line), but he's secure with this sturdy strap, heavy buckle and D ring. Looks handsome too! Excellent collar, very tough, and well made. Best collar I have ever had on one of my dogs. 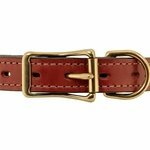 I have been looking for a quality leather collar for my dog for over 6 months. This collar is fantastic! I love the way the name plate looks, and the placement of it. I also bought a leather leash to go with it, and both are excellent quality. I'm really happy I went with the collar from Gun Dog Supply! Workmanship excellent, and good quality leather as well! Love it! Excellent collar. Excellent quality and durable. Fits perfectly. "The leather and tag are first rate quality." This collar with the ID tag is unbelievable. 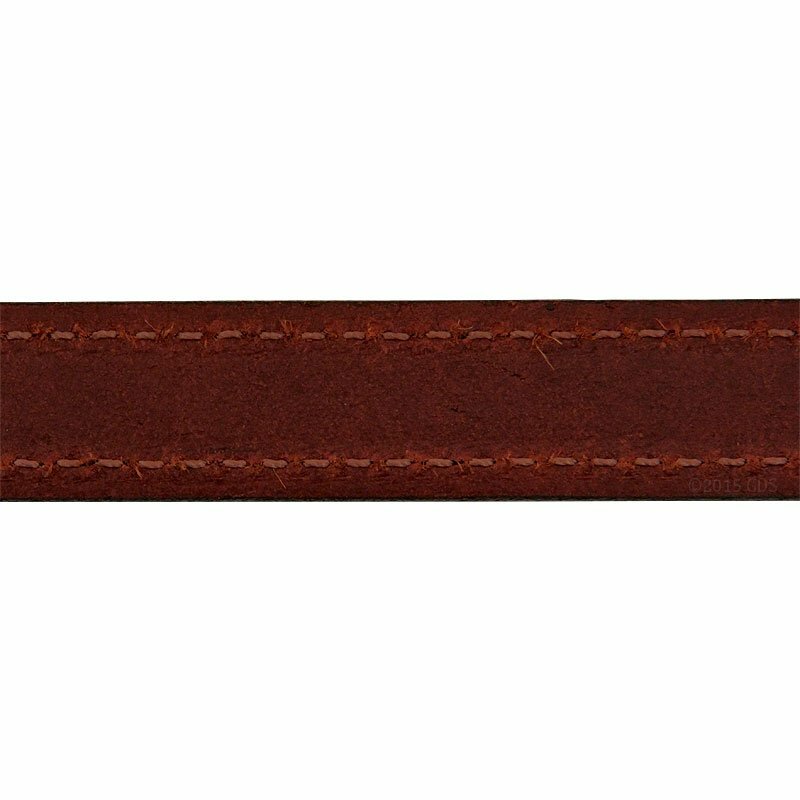 The leather and tag are first rate quality. The service I received was very helpful in choosing the collar and ID. Great company and product and have recommended them to several friends already. 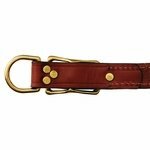 "I would highly recommend this product to anyone looking for a collar that is beautiful, functional, and will last for years." Great collar! The leather is both beautiful and durable. Maintenance is not labor intensive and only requires a simple application of some saddle soap every now and then to keep them looking great. I would highly recommend this product to anyone looking for a collar that is beautiful, functional, and will last for years. "Best collar for the dog." Best collar for the dog. It was really excellent. "The color is amazing quality, especially for the price." The color is amazing quality, especially for the price. And it was customized and shipped out fast! "Love it and it looks great on my dog"
Love it and it looks great on my dog, Wolfgang! I have looked everywhere for a leather collar and one that is not adjustable. My vet tech told me about Gun Dog Supply. I love these collars!!! "My GSP has worn it now for a year and it still in great shape." My GSP has worn it now for a year and it still in great shape. I would get another one if it is ever worn out. "Well made. Holds up in the field through all kinds of weather and elements." Well made. Holds up in the field through all kinds of weather and elements. "Good collar, but not excellent quality." Good collar, but not excellent quality. "I really like it. It looks so great on my Yellow Labrador." I really like it. It looks so great on my yellow Labrador. It is just a bit stiff, and maybe a little uncomfortable for her to wear all the time. I hope the leather softens up soon. This one was a replacement for one I bought 5 years ago. This collar of same quality as first one. It looks like Mendota is skimping on material. Stitching on leather is rougher, and it lacks a brass ring. The only reason I got the new one is because our contact information on the brass on the original collar has changed. Looks like good quality leather and very pleased at first blush... In one year I will be able to give a more honest opinion considering wear. 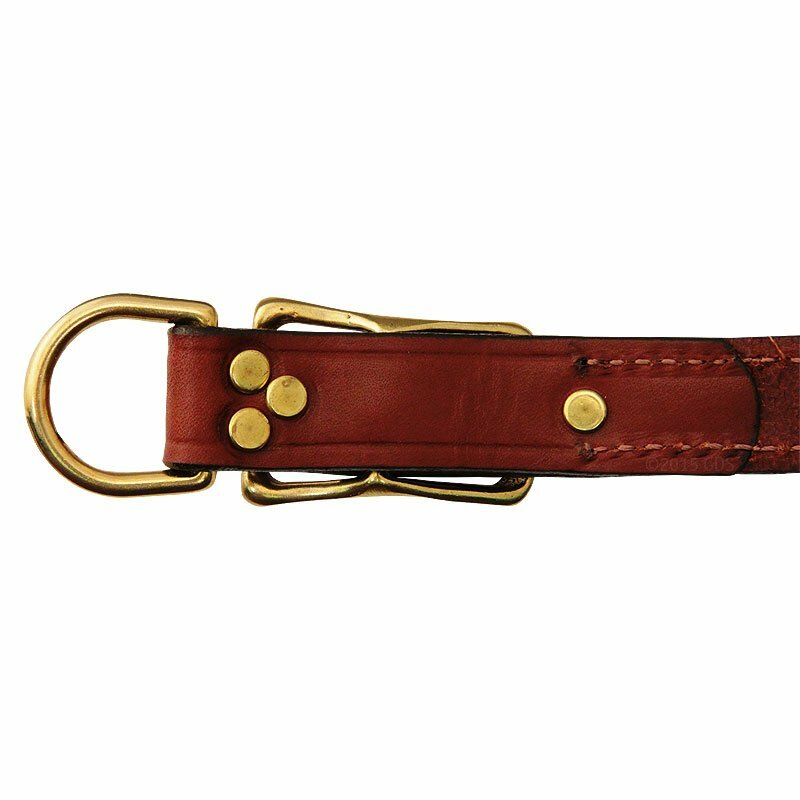 A good leather dog collar should last the life of a hunting dog. This is my forth collar of this make and type...14in (2), 16in and an 18in. Excellent collars! It would have been excellent, but I don't think I looked close enough into the specs. I was interested in getting the collar the has a cushion trim on the inside for my dog's neck because that's what I had had seen on another customer collar. But overall: excellent quality leather, shipping was fast, and looks great. "Collar is very nice, but I am a bit disappointed with the colour." Collar is very nice, but I am a bit disappointed with the colour. It is much more cherry red in reality than the picture shows. I was trying to match to my dogs coat colour. Would be better if ring was on opposite side of buckle to hold excess: otherwise very good. There is nothing to hold the piece of the collar that goes through the buckle, so it curls out. This leather hunt collar is a must for the distinctive working dog. Great looking and extremely durable. 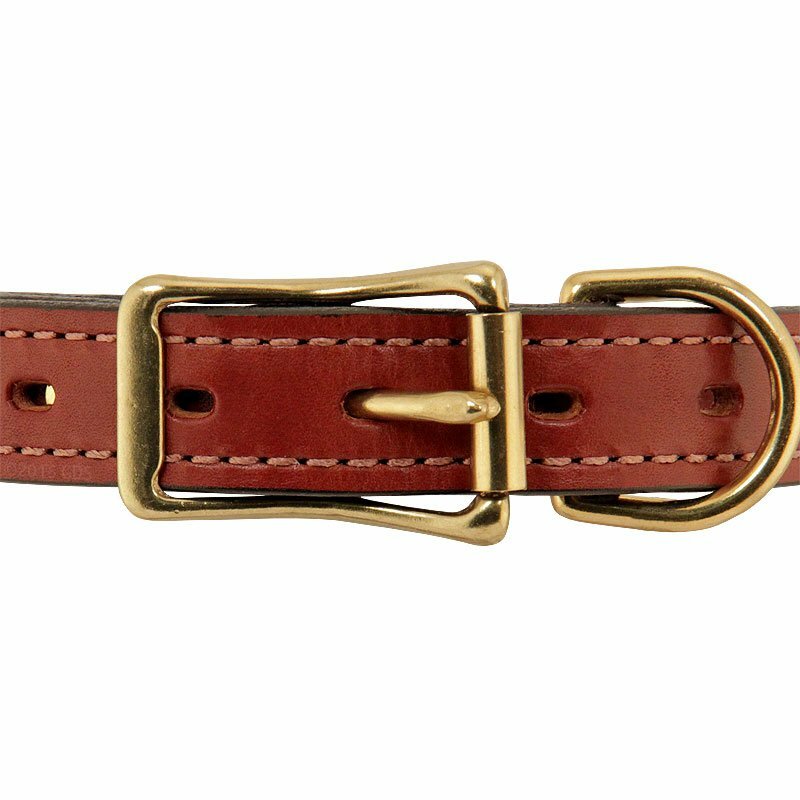 Fully stitched design with solid brass roller buckle and dee ring. Made in the USA.